With Star Wars: Rogue One being launched tomorrow in Belgium, it’s time to bring out the collaborations. Well, considering that it is also winter in the Northern Hemisphere, this collaboration is perfectly timed. Coming from legendary textile makers and Star Wars, we are very happy to introduce the Columbia X Star Wars: Rogue One Jacket Collection. Three distinct jackets; one for the ladies, and two for the guys, this collaboration does not disappoint. So, if you were looking for a new jacket with some kickass style, and a way to prove your allegiance, then this collection is definitely for you. Check out the videos below. This parka was designed to withstand the harshest of conditions; even some intergalactic ice world. First off, we’ll start with the men’s Rebel Parka that was inspired by the apparel worn by Captian Cassian Andor. This is a limited edition parka that was designed to withstand the harshest of conditions, even an intergalactic ice planet, or some-place similar here on Earth. This jacket features a faux fur hood for superb comfort. It also comes with Omni-Heat Reflective to trap in your body heat. Furthermore, it features Omni-Tech waterproof material to keep you dry come rain, sleet, or snow. 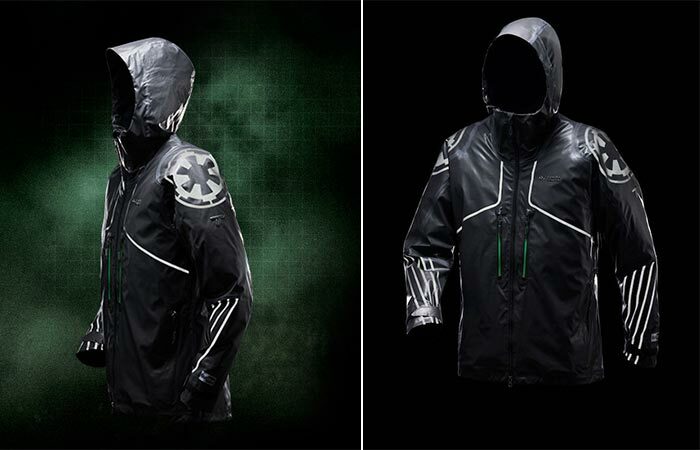 The Imperial Death Trooper jacket is waterproof and yet breathable. It makes for an excellent rain suit. 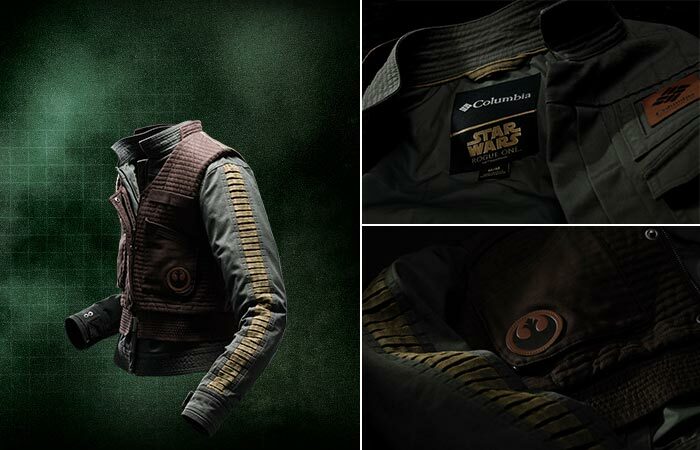 Second on the list is the men’s Imperial Jacket. This jacket was inspired by the Death Troopers and even comes embellished with the Imperial logo. 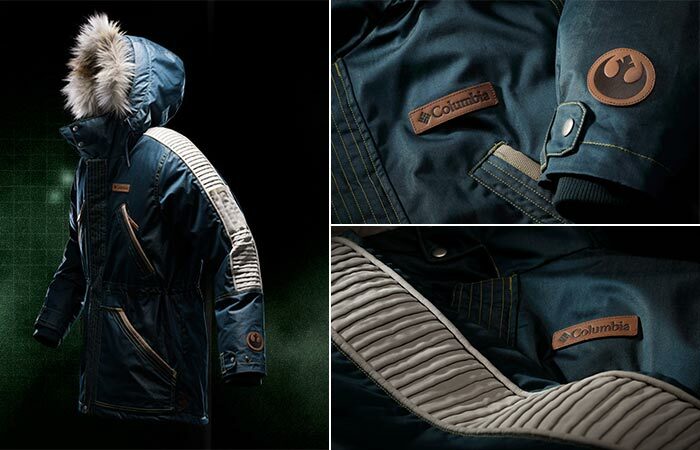 In addition, this jacket is waterproof, breathable and fully seam sealed. It also comes with Columbia’s award-winning Outdry Ex Diamond shell. This includes a 2-way underarm ventilation and Light Rail zippered pockets. The Jyn Erso inspired Rebel Jacket and Vest is a woolen vest and jacket for women. Lastly, they have the women’s Rebel Jacket and Vest. This piece was inspired by Jyn Erso and would make an excellent Christmas gift for your Star Wars loving girlfriend or wife. It was crafted out of heavy cotton twill, and it features leather-like details on the sleeves. The quilted vest can also be worn on top of the jacket or separately. Get it from Columbia here.